Chaise lounges are known to induce napping and states of relaxation. Our selection includes chaise cushions of many sizes and shapes with your choice of fabric. A perfectly good piece of furniture you have owned for many years can be revitalized with some new cushions. When your chaise needs replacement cushions, look no further and order today! We offer a plethora of design and style options to help you create the right look and feel for your outdoor Chaise Lounge. Outdoor spaces and Chaise lounges go perfect together. If you have a pool, a chaise lounge is the perfect addition but when their cushions start wearing down it is time to have them replaced. We are here to help you decide on a Chaise cushion that will bring out the style you want to create in your outdoor space. What are our Cushions made out of? All of our outdoor Chaise cushions are made from the finest fabrics available. We understand that the elements of the outdoors can rapidly change the look, feel, and color of your outdoor wicker patio furniture which is why we use only the most durable outdoor fabrics on the market today. Our cushions give you protection from more than just the elements. When you shop at Wicker Paradise you can be rest assured quality is not being sacrificed for quantity. 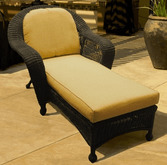 Whether you are in need of replacement cushions for your outdoor chaise lounge or indoor chaise, we can provide you with the wide variety of style options you hope for. Instead of throwing out your entire Chaise lounge shop with us and find a style and comfort level that fits your needs!